What tube amps are in use here with LaScala's and what has been tried. I would just like to know what has been tried and why it works for you. Comments from owners of other Heritage speakers using tube equipment are welcome also. I recently sold my tube equipment and am deciding what direction to go next. That said, the pair that actually garnered some unsolicited praises from my wife's sister (shocking) AND....my wife herself (ultra shocking) were the Transcendent SE-OTL's. If I were to go back to a tube amp, I personally would look at the OTL stuff first. MC 30's go great with Chorus II's and the ST-70 goes well with RB51 II's and Chorus II's. McIntosh MC275 with La Scalla II's, sound is amazing. A bit contrary to the OP 's topic but I just bought a Pass Labs Class A amp running with one of two SS preamps. And while my primaries are Jubes I thought to slide the LaScalas in position to check their performance. And I know with a new piece its easy to say how great things sound - never heard them sound this good - but in truth the LS show little lack of bass, more than Ive heard with numerous other amps. Absolutely a full soundstage from their placement in front of Jubes, about 20 feet on center. But, and here I go, the LS sound as balanced as I've heard them with other amps. And yes I've run them with DHT single ended 2a3 monos, single eneded KT88, etc. in my opinion to fill out a sometimes lean LS presentation takes not only power (this Class A is only 25 but starts to double down as speaker ohm falls) but also a very stout power supply in the amp. So it ain't only tubes that can get LS to present properly. Mcintosh MC 30 mono blocks, mcintosh MC 225, mcintosh MC 240, fisher 500 C, Scott LK 150, fisher X202B. It’s very difficult to go wrong pairing any one of those with a good set of LS. Anyone have any experience with PrimaLuna amps. A what a what a? I’m using a Decware SE34I.3 Rachael and conrad johnson PV10B preamp with my La Scalas. They're in a small room so I don’t need much power. The Decware is around 5 watts per channel using EL34 tubes. I like the sound of this set up very much. Especially when playing vinyl. The Prima Luna amps look very nice. If anyone has tried those I'd like to read your opinions too. I have also had the Rachael and the Torii Jr and they were quite excellent, but I am thinking I would like to try something else this time. I’ve been looking at the conrad johnson Classic 62 amp. It used the EL34 power tube and is available in several older version via the used market. That might be worth a try. More watts per channel from the same tube as the Rachael. I used the primaluna dialoge integrated with my la scalla ii, they sounded good, but the mc275 is a different level for sure. I sold my primaluna. What does the MC275 bring that was so much better. I have used an AMC CVT2030 (30wpc push pull el34 with a mosfet input stage). Sounded great but had reliability issues over the long term. Then I tried a Musical Paradise MP-301. It is an SEP that can take a variety of tubes. It sounded good and it was fun trying different tube types (I used el34, 6l6 and kt-88s). However it was noisy at idle. Too noisy for La Scalas IMO. Would probably be fine with less efficient speakers. Recently, I have biamped using a MiniDSP. Running SS on the bass bins and a VTA ST-70 on the top end. I am using a 2” driver in a 2-way configuration, so it really isn’t a LaScala anymore. This is by far the best setup I have ever had. I think the biggest issue with using tubes and LaScalas has been getting a setup with low enough noise. Tube amps are inherently noisier than solid state at idle. A 104 dB speaker makes this obvious. Totally worth it though, as once you hear that tube goodness, you just can’t live without it! Next I really want to give a Transcendent Sound OTL a try. I think that power will not be an issue since I am biamped. I have McIntosh MC30 and Dynaco Mark IV. I was listening to some jazz just a few minutes ago with my LaScalas and my Dynaco's, something about that combination that I could just sit and listen to for hours. Class A, whether tubes or SS. One can save money buying a class A tube vs what a class A SS cost without sacrificing anything significant. Very similar sounding when designed properly. Curious richieb, which Passlabs amplifier did you purchase. 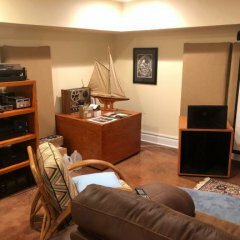 Been hearing a lot of positive info on your amplifier especially on the diyaudio forum. There is also a presentation by Nelson on youtube about the technology behind this new offering from Passlabs. There has been some efforts to duplicate the design called the F4 beast on the diyaudio forum. The problem on trying to duplicate the output transistors without having degeneration is the careful matching of the transistors when they cost like $25 apiece and one would need a quantity to get a good enough pair. Nelson buys parts in the thousands so it is not a big deal other than time evolved finding a good enough match for Passlabs. Those output transistors used are referred to as hockey pucks because of their size. Congratulations on your purchase. You are the first I have heard of buying the XA-25. All Passlabs amplifiers are overbuilt to race car standards and should last a lifetime. Passlabs also supports all their products past the warranty period no matter how old. I am envious. You must do a detailed review of your new purchase.